Today I was kind of enjoying (okay, not really) a run around Table Mountain. 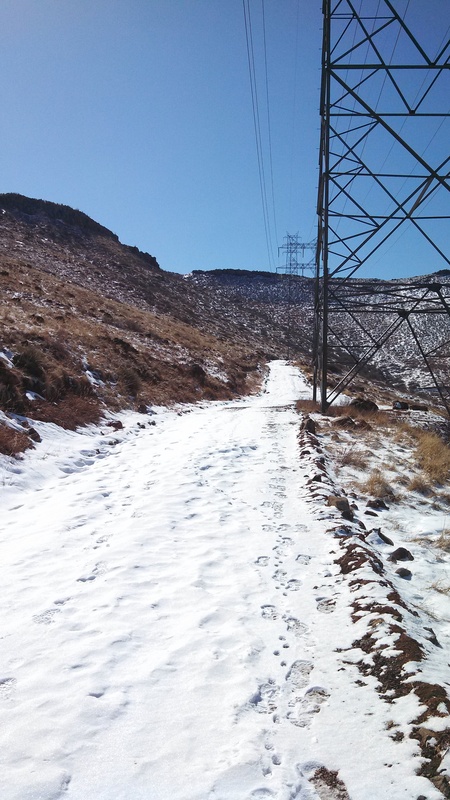 The trail was packed with hard snow and ice and, in areas where there was no snow or ice, there was mud. I made every effort not to twist my foot, get stuck in a footprint hole or trip over a rock. And it was not a level effort. There were the ups and downs. Some of the ups were so steep that I just couldn’t catch my breath. So, I was struggling around a corner when all of a sudden I saw something moving out of the corner of my eye. I swear to you that my first thought was “wolf.” But then I realized that wolves are extremely rare in Colorado. Then I thought it had to be someone’s dog. The dogs around here bark when you come to close. No, it didn’t look domestic. I swear it looked like a wolf. It was the size of a wolf. Whatever it was, it was heading in my direction. Fortunately, there was a barbed wire fence between me and the wild dog. Yet, I still felt my heartbeat speed up as it trotted towards me. This wild dog had a mission: to get through the fence. I didn’t want to be around when that happened so I continued forward on the trail. I didn’t want to turn around because there were no houses back where I had come from… only vast open fields. I tried to tell myself that it must be a coyote. There are thousands of coyotes in this area. We hear coyotes howling at night and my husband has seen them in our neighborhood. For some reason I still didn’t feel any better. It was just me and the coyote and a lonely trail. It continued to follow me along the fence line and then I started to panic slightly. Okay, so I did what you shouldn’t do… I ran faster, nearly tripping over my feet in the snow, ice and rocks. I passed the area where the fence met another fence and there was no chance that the coyote could go any further without passing through a hole in the fence. I didn’t want to take that chance so I ran faster. I considered jumping over the fence into someone’s property and running to their house, but then I imagined myself slicing my legs on the fence or crashing down the hill that led to the houses. It was pretty steep and rocky. I decided to stay on the trail. At one point I forced myself to glance back, but I didn’t see the wild dog anymore. I wasn’t sure if I could continue at this pace all the way around the mountain. A few minutes later I encountered a trail that went down into the neighborhood. I figured that it was better to be safe than sorry. There was not point running around on a mountain with a coyote. Who knows what he was doing. I thought they usually traveled in packs at night. It was the middle of the day. And I did not see one soul on that trail while I was running on it. I ran down to a road and couldn’t decide whether to turn left or right. If I turned right then I would have a very long ways to go around the mountain back to my car. If I went left I would pass by the area where I had seen the coyote, but I would be further down and next to the houses. I wasn’t sure if it was smart, but I headed back in the direction of the sighting. I figured I could run up to someone’s house if I saw the coyote coming down to the road. When I got close to the area, I stopped and looked really hard. I couldn’t see any signs of movement. I continued on and ended up running an extra 3 miles just so I could stay on roads within the neighborhoods. By the time I got back to my car I realized that I had probably overreacted. When I googled “coyote encounters” the Humane Society’s website stated that issues between humans and coyotes is extremely rare. And the encounters usually only occur when another animal is present (like the family dog). Funny enough, the website emphasized that you had a greater chance of being killed by a flying champagne cork. Lastly, it mentioned that you should stop and make yourself big in order to scare it away or slowly walk backwards until you are out of sight. You should NOT turn your back to it and run. What was I thinking about when my adrenaline spiked? Making sure I turned my Garmin back on as I started running. Okay, maybe that has just become a subconscious habit. I thought about what the teachers would think if I didn’t pick up my girls on time. I also thought about the knife on my running belt. I was suddenly thankful for that little device. It’s funny because just the other day some members of my running club were asking me about it. I am not sure what they were thinking, but I told them that you never know when you might need one. They just gave me an odd look. Unpredictable wildlife is one good reason to carry a knife. Unpredictable humans is the other reason. This entry was posted in Running Experiences and tagged Colorado, Colorado wildlife, coyote encounters, rattlesnakes, running and wildlife, Table Top Mountain.